Nine Canadian National Railway cars derailed during afternoon rush hour today in downtown Winnipeg (Reuters plus other sources). Seven cars were loaded with sand and two tank cars were full of residue. A passer by said some of the cars were tipped sideways. Traffic was delayed as two roads were temporarily closed. It is not known how long the rail line will be out of service. Also today, the Transportation Safety Board (TSB) of Canada released a report (TSB Report R13Doo77) on its investigation of the November 6, 2013 derailment of 10 empty Canadian National Railway cars in the Taschereau Yard, Montreal, Quebec (CNW). 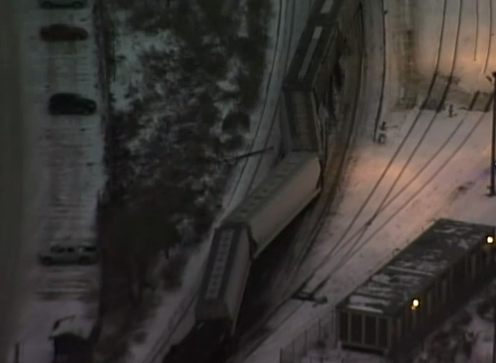 The derailed cars and the track were damaged. The TSB determined that improper train marshalling by CN contributed significantly to the derailment. CN had a block of empty cars marshalled ahead of a block of loaded cars which resulted in the empty cars experiencing a significantly higher lateral/vertical force than the loaded cars. CN has been warned many times by the TSB about improper train marshalling which has resulted in many other CN derailments. For more information on CN derailments, read CN Railway Derailments, Other Accidents and Incidents. ~ by railroaded on January 21, 2015.